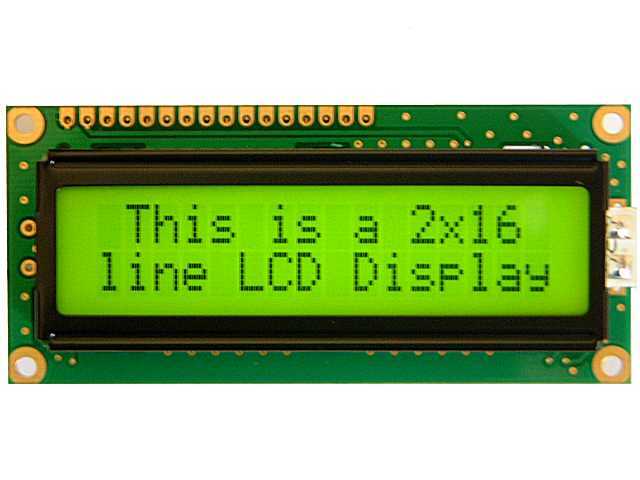 The General purpose 16x2 or 16x1 char LCD are very easy to interface with any microcontroller , and these lcd are really very cheap and thoroughly available in the whole world. Once you learn how to interface it, it will be the easiest and very reliable output device used by you! More, for micro controller based project, not every time any debugger can be used. All the LCD displays use the same, or any one of the IC s based upon the architecture introduced by Hitachi. This component is specifically manufactured to be used with microcontrollers, which means that it cannot be activated by standard IC circuits. It is used for displaying different messages on a miniature liquid crystal display. The model described here is for its low price and great capabilities most frequently used in practice. It is based on the HD44780 microcontroller (Hitachi) and can display messages in two lines with 16 characters each. It can display all the letters of alphabet, Greek letters, punctuation marks, mathematical symbols etc. It is also possible to display symbols made up by the user. Other useful features include automatic message shift (left and right), cursor appearance, LED backlight etc. DDRAM memory is used for storing characters to be displayed. The size of this memory is capable of storing 80 characters. Some memory locations are directly connected to the characters on display. Everything works quite simply: it is enough to configure the display to increment addresses automatically (shift right) and set the starting address for the message to be displayed (for example 00 hex). Afterwards, all characters sent through lines D0-D7 will be displayed in the message format we are used to- from left to right. In this case, displaying starts from the first field of the first line because the initial address is 00 hex. If more than 16 characters are sent, then all of them will be memorized, but only the first sixteen characters will be visible. In order to display the rest of them, the shift command should be used. Virtually, everything looks as if the LCD display is a window which shifts left-right over memory locations containing different characters. In reality, this is how the effect of the message shifting over the screen has been created. If the cursor is on, it appears at the currently addressed location. In other words, when a character appears at the cursor position, it will automatically move to the next addressed location. This is a sort of RAM memory so that data can be written to and read from it, but its content is irretrievably lost when the power goes off. 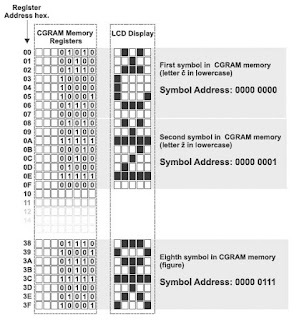 The addresses of CGROM memory locations match the characters of ASCII. If the program being currently executed encounters a command ‘send character P to port’ then the binary value 0101 0000 appears on the port. This value is the ASCII equivalent to the character P. It is then written to an LCD, which results in displaying the symbol from the 0101 0000 location of CGROM. In other words, the character ‘P’ is displayed. This applies to all letters of alphabet (capitals and small), but not to numbers. As seen on the previous map, addresses of all digits are pushed forward by 48 relative to their values (digit 0 address is 48, digit 1 address is 49, digit 2 address is 50 etc.). Accordingly, in order to display digits correctly it is necessary to add the decimal number 48 to each of them prior to being sent to an LCD. What is ASCII? From their inception till today, computers can recognize only numbers, but not letters. It means that all data a computer swaps with a peripheral device has a binary format even though the same is recognized by the man as letters (the keyboard is an excellent example). In other words, every character matches a unique combination of zeroes and ones. ASCII is character encoding based on the English alphabet. ASCII code specifies a correspondence between standard character symbols and their numerical equivalents. Apart from standard characters, the LCD display can also display symbols defined by the user itself. It can be any symbol in the size of 5x8 pixels. 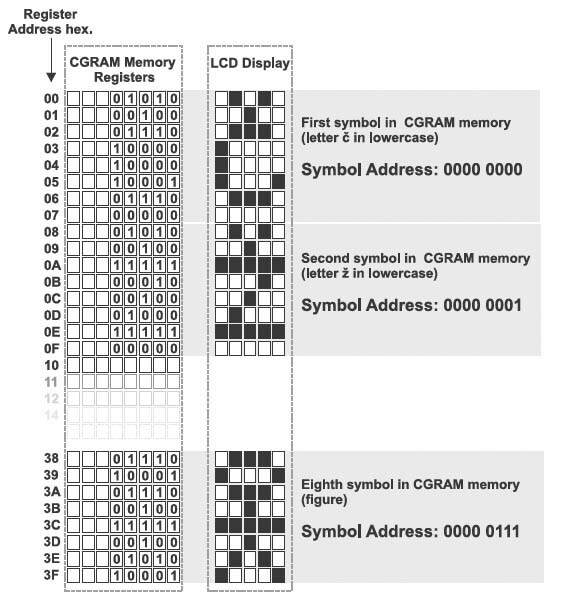 RAM memory called CGRAM in the size of 64 bytes enables it. Symbols are usually defined at the beginnig of the program by simple writing zeros and ones to registers of CGRAM memory so that they form desired shapes. In order to display them it is sufficient to specify their address. Pay attention to the first coloumn in the CGROM map of characters. It doesn't contain RAM memory addresses, but symbols being discussed here. In this example, ‘display 0’ means - display ‘č’, ‘display 1’ means - display ‘ž’ etc. Set DDRAM address to AC, this instruction makes DDRAM data available from MPU. In 1-line display mode, DDRAM address rangers from “00H” to “4FH”. In 2-line display mode, DDRAM address in the first line ranges from “00H” to “27H”, and DDRAM address in the 2nd line is from “40H” to “67H”. DL=’1’ means 8bit mode of data transfer. D=’0’ means entire display is turned off. But Display data remains in DDRAM. B=’1’ makes cursor blink periodically. B=’0’ stops the cursor to blink and cursor looks steady if the Cursor is turned on. When I/D= ’1’ cursor moves to the right and DDRAM address is increased by 1. When I/D= ’0’ cursor moves to the left and DDRAM address is decreased by 1. This instruction sets the address counter to ‘00H’, and returns the cursor to the first column of first line. And if display is shifted previously, this instruction shifts this too. The DDRAM contents don’t change in this instruction. Clear all the display data by writing “20H” (ASCII code of ‘space’ character) to all DDRAM address, AND set value DDRAM address counter (AC) to “00H”. It returns the cursor to the first column of first line and sets the entry mode to increment mode (I/D=’1’). To send data in 4bit mode; first put upper 4bit in the 4 bit data bus connected to 4MSB pins of LCD display, then put control signals in the control bus, then pulse the E pin once. Next put the lower 4 bit in the data bus and pulse the E pin again. Here is a flowchart simply describing it. 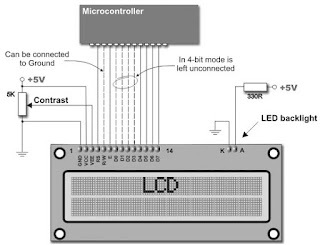 Depending on how many lines are used for connecting an LCD to the microcontroller, there are 8-bit and 4-bit LCD modes. The appropriate mode is selected at the beginning of the operation in the process called 'initialization'. The 8-bit LCD mode uses outputs D0- D7 to transfer data as explained on the previous page. 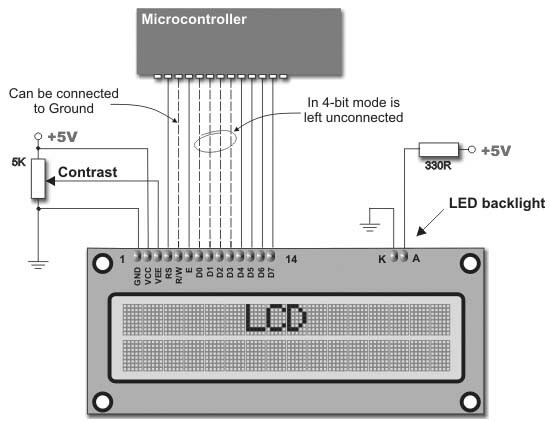 The main purpose of the 4-bit LCD mode is to save valuable I/O pins of the microcontroller. Only 4 higher bits (D4-D7) are used for communication, while others may be left unconnected. Each piece of data is sent to the LCD in two steps- four higher bits are sent first (normally through the lines D4-D7), then four lower bits. 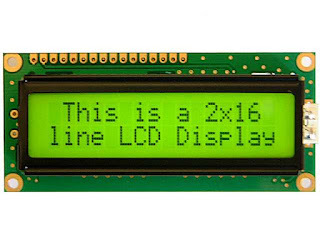 Initialization enables the LCD to link and interpret received bits correctly. Data is rarely read from the LCD (it is mainly transferred from the microcontroller to the LCD) so it is often possible to save an extra I/O pin by simple connecting the R/W pin to the Ground. Such a saving has its price. Messages will be normally displayed, but it will not be possible to read the busy flag since it is not possible to read the display either. Fortunately, there is a simple solution. After sending a character or a command it is important to give the LCD enough time to do its job. Owing to the fact that the execution of a command may last for approximately 1.64mS, it will be sufficient to wait about 2mS for the LCD. We are LCD module manufacturer in China and we are supplying Graphic LCD display Module & Character LCDdisplay Module, Dot Matrix LCD display Module etc.